At the end of November 2017, we launched our new logo. Here at the beginning of 2018, DataMaster Labs / Printer-Benchmark.com is rolling the new corporate identity out to DMO, and updating our reports for even greater clarity! This question is particularly important for sales forces in the printing solutions industry - an exceedingly competitive market place. There's a new menu so DMO subscribers can simply and intuitively choose the different comparison modes - one click is enough! The Standard, Pro, Smart and Winner comparisons allow advanced comparisons of up to eight machines out of the thousands of devices analyzed in the DMO tool. They are all very easy to use. They have been designed to help both sales and marketing teams to stay up to date in the printing solutions market, to be more confident and to show greater professionalism in customer meetings. The Smart comparison and the Winner comparison greatly simplify the reading and analysis of technical comparisons. They give sales teams points of differentiation - which were difficult to find up to now, for lack of exhaustive information. 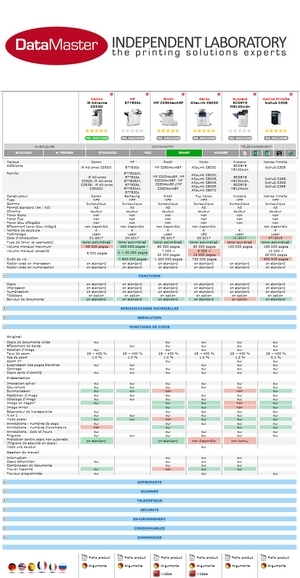 The Smart comparison includes the dynamic coloration of technical data according to their performance, compared to the other equipment in the comparison basket - the data in green being the best, and the data in red being the weakest. The Winner technical comparison filters positive data for a specific machine: this allows you to visualize almost instantly all the your product's strengths - and this makes a perfect customer leave-behind (in pdf). The Pro and Smart comparisons can be downloaded in Excel format. These technical comparisons are great tools for agile sales support. They let our subscribers build a powerful commercial approach based on these positive points, and the competitors' weaknesses - but also to anticipate competing arguments and to prepare responses to objections submitted by the customer or the prospect. Our DataTech technical specifications sheets have a new, modern look too: more legible, more airy, our documents are still the most complete to make your choice in complete transparency. 2018 is off to a flying start for DataMaster Labs / Printer-Benchmark.com. We wish you an excellent year, placed just like ours under the sign of innovation!